Pre-Shred Day 1 – Tues 2/15 – Shred Level 1 – Evening workout, using water bottles as hand weights. Video was very challenging! Was moderately sore the next day. Felt great after. Pre-Shred Day 2 – Wed 2/16 – Shred Level 1 – Despite the soreness, repeated Level 1 after dinner. I was excited to do the workout. So very sore afterward. Extremely sore the next day! Especially in my quads. Pre-Shred Day 3 – Thu 2/17 – Shred Level 1 – Did Level 1 workout again. Couldn’t push as hard through some of the moves since I was so sore! I could seriously barely walk up stairs without grimacing all day. Pre-Shred Day 4 – Fri 2/18 – Day off. Too sore/no motivation on Friday night. Ordered the DVD on Amazon since it was running on out Comcast On-Demand soon. Pre-Shred Day 5 – Sat 2/19 – No shred. Worked on several weight machines with Jessica at her gym. Pre-Shred Day 6 and 7 – 2/20 & 2/21. – Days off. Day 2 – Wed 2/23 – Was only very mildly sore, mostly in my glutes! I was so surprised, I thought I would be in agony after using hand weights the first time. I was looking forward to my workout tonight, and repeated Level 1. The cardio segments feel like they are becoming slightly more manageable. But the bicycle crunches still make me want to scream and cry. In a good way. I am a very goal-oriented person, so I love the idea of making progress toward of goal of 30 days of shredding! Granted, there will probably be some days that I have no time or motivation, but hey, life happens! Is this interesting? Should I keep tracking my progress each day? On a side note, my toe has been spasming badly the last couple of nights! Does this happen to anyone else? I should preface this anecdote with the fact that I am a CHRONIC toe-cracker. I cannot stop this habit. I’ve done this ever since I was very young. When I am not wearing shoes I crack my toes like every 10 minutes. I must admit, I am rather skilled at it. And sometimes, if I over-crack, my toe will spasm. My spasm, I mean that my second toe will lock up, very painfully, in a contorted position, and I have to manually move it back into place to fix it (usually while wailing lots of four letter words!!). Ouchie!! Well, sometimes when I exercise, this exacerbates the toe spasms, and so last night and tonight I have been experiencing them if I move my foot into an odd position. Does this happen to anyone else or am I just a weirdo!?!? So anyway, back to food, since this is a food blog. I have come to realize (or rather, it has been brought to my attention ) that my soup posts aren’t the most exciting things in the world, so rather than give you an in depth description of my soup-making methods, let me leave you with a few pics. 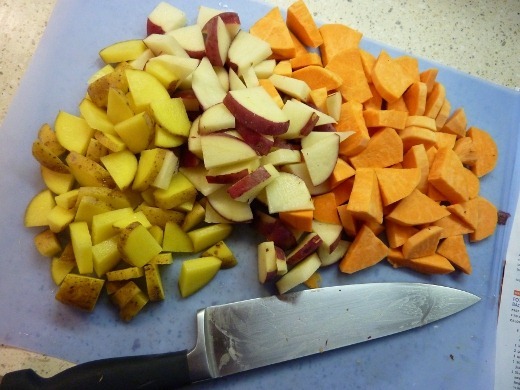 This soup was pretty easy, but you must be in the mood for plenty of chopping: a whole onion, two Yukon gold potatoes, two red potatoes, and a big yam! Oh and it’s topped with bacon! Very good soup (I’d rate it 8/10), but a bit too starchy. It needs some beans or something in it! 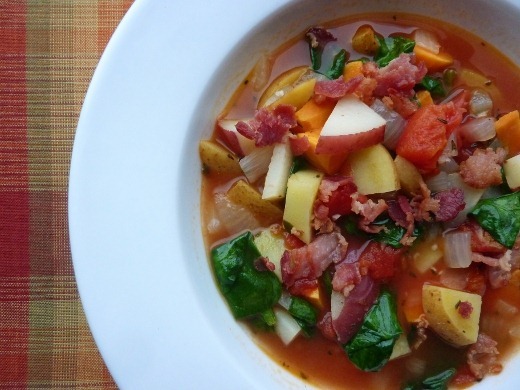 But definitely a guilt-free comfort food. Today my calorie consumption was on the low end so I am treating myself to a brew (or two) tonight. 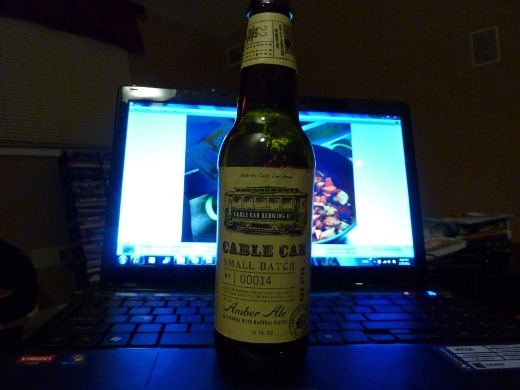 This Amber Ale from Cable Car Brewing Co. was on sale at Whole Foods but I’m quite unimpressed by it. Oh well! Okay, I am off to go finally (legally) download the new Radiohead album, King of Limbs. I am GEEKED!!!!!!!!!! Thanks! The lap-swimming sounds impressive! I’ll keep tracking it! Daily updates will be posted under the “30 Day Shred” tab located at the top of this page. Pingback: Pantry show and Tell « Meg.Goes.Nom.Nom.